The other day I watched a CNBC program called ‘Biography’. The program was about Dave Thomas, the founder of Wendy’s restaurants, and the adversities he faced when he first went into business for himself. It got me thinking about my own business, and the adversities I’ve faced throughout my 28-year career in professional sales. There are always obstacles that block the path to success. Dave Thomas’ story is particularly interesting in how he over came adversity to succeed in business, despite overwhelming competition. When he was 12 years old, Thomas started working at a barbecue restaurant in Knoxville, Tenn., according to the company’s Web site. Thomas eventually moved into a management position with Kentucky Fried Chicken, where he met one of the greatest influences in his life — Colonel Harland Sanders, KFC founder. 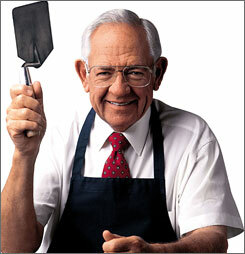 In 1969, he opened his first Wendy’s restaurant in Columbus, Ohio, naming it after his daughter. Today, Ohio-based Wendy’s operates about 6,000 restaurants in the United States and Canada with systemwide sales of more than $7 billion. During the program interview with Dave Thomas, Mr. Thomas spoke about the seemingly insurmountable odds he faced establishing Wendy’s as a hamburger restaurant that competed against the likes of McDonalds and Burger King, the gigantic enterprises that they were. Many people told him that he was crazy to go into business when he could not possibly compete against the much larger competitors. Many offered discouraging advice to pursue other business ventures instead of founding a hamburger restaurant chain. Dave would not hear any of it. He was determined and persistent to say the least. He believed in his product no matter what because he believed it was better than the competition. When things weren’t going so well, Dave couldn’t help but start to think twice about staying in the business. That’s when he would visit one of his first restaurants and have a hamburger. It tasted so good to him that he was instantly convinced that he had a better product, and that people would soon catch on to his superior product. That’s what kept Dave Thomas going, despite the odds not being in his favor in the very early days of Wendy’s Restaurants. How about you? Having doubts about your business, product, or career? How does your ‘hamburger’ taste? Take a bite and what does your ‘stomach’ tell you? If you are not totally convinced that you are having the absolute best ‘hamburger’ there is, then you need to re-think what you’re doing. 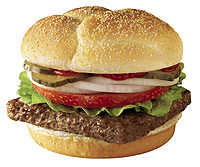 After all, if you cannot convince yourself that your ‘hamburger’ is the best, how in the world can you convince others? You are currently browsing the The Gold Call Blog blog archives for May, 2010.